These days, you’d be hard-pressed to find many people in the United States who don’t have an opinion about politics—even if they were completely apolitical a few years ago. While you’re always entitled to your point of view—on candidates, campaigns, and issues—it makes good sense to keep those opinions to yourself when job searching. Why keep your politics private? Because, in most cases, you don't have a clue about the political persuasions of the person who is interviewing you or of the management and/or owners of the company that might be interested in hiring you. They might have a completely different opinion than you do and your advocating for your candidate of choice may hurt, instead of help, your chances of being hired. The current climate is so polarized, even discussing politics with someone who belongs to the same party and/or holds the same points of view isn’t necessarily safe. It’s easy to get into the weeds with the details of this law or that party platform, and lose any connection you might have forged with someone who theoretically agrees with you. Beyond that, employers want to hire candidates with the soft skills needed to succeed in their organization. That means being able to communicate with and work alongside people who don’t agree with you. If you come into a job interview, opinions blazing, you may give them the impression that you’re not a team player. 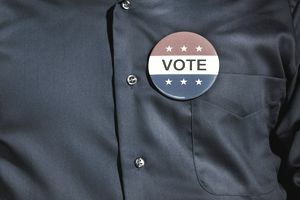 Unless you are applying for a job with a politician or a non-profit organization that is politically oriented, there is no need for politics to be involved. Coming from a family that's a mix of Democrats, Republicans, Conservatives, and a lone Independent, I know full well that political discussions can be tough enough when you know the people involved well. We've had more than a few heated discussions at the dinner table. There's no need to go there with strangers unless your political opinions are going to be part of your job description. Do not advertise your political affiliation unless it will benefit you. If you are applying for a job at your local town hall, which is staunchly Democrat, don't mention that you're a Conservative. If you are applying for a job with your local Congressman and you're both from the same political party, by all means mention it. Don't walk into an interview wearing a donkey pin. Even if the company isn't political, the interviewer might be. And if he or she is a staunch Republican, you may not get past the screening interview. Same goes for any other jewelry, shirts, scarves, what-have-you, that clearly indicates your party affiliation. In general, when picking an interview outfit, it’s best to choose clothing that doesn’t pull focus from the conversation. You want to make an impression with your words, not your accessories. Do you have a personal website or blog that shouts your viewpoints to the world? Don't bring it up during an interview. If you are really radical (in either direction) you might want to consider using only your first name or a different last name on the site, depending on what type of jobs you are applying for. Radical politics and the corporate world often don't mix. If you have volunteered for a political campaign, you may not (and don't have to) include it on your resume. What you do on your own time is your business, and potential employers have no need to know. In fact, it may be best to keep your political and professional lives separate—again, unless you’re working for a political organization. What if you are asked which party you belong to or which candidate you support in an interview? In the United States, it isn't legal to ask what political party you are affiliated with. However, just because it isn't legal doesn't mean that you won't be asked. You can opt not to answer the question or diplomatically say that you haven't decided yet. When it can benefit you, use your politics to your advantage. Otherwise, be discreet when you job search and keep politics out of the process.